Props for Such a Cute Baby Shower Invite! 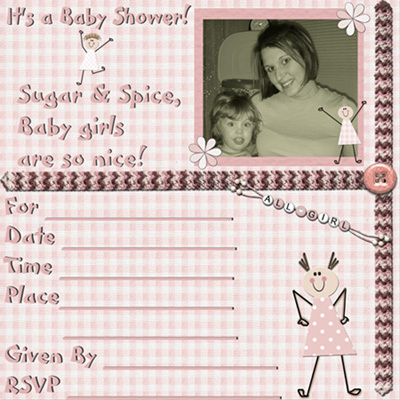 Ashlee from Oklahoma submitted this creative and very cute Sugar and Spice girl baby shower invite. I absolutely love it!! Thanks to Ashlee for sharing her creativity with the rest of us! She is helping to make this website a more helpful resource for everyone who is planning a baby shower. I wanted to do something different for my friend's baby shower. She is having her 2nd daughter so I used my digital scrapbooking software and created the perfect little girl invitation. To personalize it, I used a picture of her and her daughter on the invite. It turned out great!! Our baby shower invitation ideas page is a forum for baby shower hostesses and/or mother's-to-be to share and show off their baby shower invitations. It is a great place to come and get baby shower invitation ideas to make your own invites!